Sometimes I talk to myself. But, don't we all? I remember a time long ago when I was much younger. I was at a nightclub in Williamsburg, Virginia. The nightclub was located in, or rather, under a hotel. Willamsburg has a college so, of course, the club was frequented by the local college students. I was not a college student. I was already in the military and doing some special operations training in the local area. I was like a wolf, let loose in the hen house. But, I digress. Let me get back to the story. This club, being the local college hangout, had all kinds of nighttime activities. 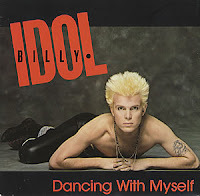 The night I was there, they were having, among other things, a "dancing with myself" contest. Did I mention that I was young and single during this time? Of course, Billy idol was very popular at the time and his music got lots of airplay. I knew the song well and, although I will never admit it out loud, I may, or may not have danced to the song by myself more than once. I won the contest. I suppose I did not win through any great measure of skill or dancing abilities, rather, I likely won because I simply had a greater display of uninhibited foolishness than anyone else there. Unlike many of the students in the club, I would not have to face the people in the bar the next day at class. The prize was a Billy Idol album (and, yes, I mean album - not cassette or CD) and a certificate awarding the recipient a free dinner for one at a local restaurant. Now, let me regress from the digression after my first digression. What I really want to write about here is self or internal dialogue. OK, I suppose I should have titled this post "Talking to Myself" but who wants to read some frippery about self dialogue. Although something not often discussed, internal dialogue is a very important, but dilute subject for writers. I struggle with just how to show self dialogue, internal dialogue, or even speaking out loud to one self. (Or is it one's self - that's a subject for later) And, by the way, what's the difference between all these methods of self talk. Every time I think about the subject of self dialogue and internal thought, I imagine the character in that movie. Often, characters (or people) talk to themselves quite differently than they talk to others. It's kind of a dichotomy of personality. One may put on a brave front for others but show great self-doubt and reservation internally. How do we show something like this as writers of grand stories? Of course, by using internal dialogue and self dialogue. First, let's distinguish between what is considered internal dialogue, internal thought/self thought, and self dialogue/self talk. These are all forms of dialogue but should be categorized so the proper grammar is used. Using a set of standard grammar rules when expressing self dialogue or internal dialogue helps the reader to better understand what the character of the story is doing or saying. Internal dialogue is when a character makes a statement within their own head. The key to recognizing internal dialogue is that, even in reading the words, it must be clear that the character does not actually speak out loud. Self talk, on the other hand, may involve the character actually saying something. Chances are, the character is saying to themselves, but it is still communicated out loud. So how can we, as writers, properly write internal dialogue and self talk. If one wants to write internal dialogue (where one talks to them self, but no words are spoken) then it is shown by putting the dialogue in italics. It is still considered acceptable in some circles to use quotations but the standard is quickly moving toward italics alone for internal dialogue. If one is writing a manuscript, say on an ancient typewriter, and italics are not available, the dialogue phrase should be underlined to designate to the printers the section in italics. Years ago, this was the only way to designate internal dialogue so many writers simply used quotes because one can always find those on even the oldest typewriters. But, now, with the invention of computerized word processing software, one can just insert the italics where needed. Easier said than done, Romy thought. I'd like to see him try. The above phrase works well in italics. Notice that the dialogue tag is not italicized. One issue I've run into using italics to denote internal dialogue is that it limits one's ability to show emphasis using italics. I wrote the above phrase specifically to show this. If I were writing this, I would possibly like to emphasize the word him. "Easier said than done," Romy thought. "I'd like to see him try." Expressing internal dialogue this way is acceptable but, just remember, your agent, editor, or publisher may prefer you use italics. Also, It's important to stay consistent in writing. Whether you choose to use quotes or italics, you should stick to it throughout the manuscript. My reason for posting this subject is simply to help others that may have done the same thing I have. I was unsure of these rules and am now struggling through a manuscript, tediously picking out all my changes and re-writing - it's a long and painful process. "Easier said than done," Romy mumbled as the screen door slapped against its wooden frame. "I'd like to see you try." I'm reminded of a little saying I once heard. "If a man speaks, and his wife is not there, is he still wrong?" Remember, If your character speaks out loud, even to themselves, use quotes. If you are describing thoughts of your characters, use italics preferably, and quotes if needed. Just remember to check with those responsible for publishing your work, and whatever you choose, stay consistent. I love the saying... it's so true. That's cool that you won an album by dancing. Also, I loved your explanation on internal thought. I will tweet this. I have a a couple scenes of internal dialogue, but none are in italics because the characters also communicate telepathically - and that IS in italics. Thanks for your comments. Yes, I was not sure just how many folks would actually know what an album was. Alex, I never considered how one might grammatically show people communicating telepathically. That sounds challenging. I suppose they are talking to each other but there is now actually verbal communication. Wow, what a challenge. you are full of surprises! I wish I had seen that dance off! dialogue is a challenge. But for me the advantage of writing is that I get to perfect something that I usually verbally mess up. I'm writing an interview today for three word wednesday.